In recent years, inequality has become the core economic concern of the American left. The gap between the haves and have-nots is understood to be the fatal flaw of our economic system — a fundamental problem that is the source of countless other difficulties. To hear many liberals tell it, increasing inequality is holding back growth, crushing the prospects of the poor and middle class, and even undermining American democracy. Such concerns are prominent in President Obama's rhetoric, and seem also to drive key parts of his policy agenda — especially the relentless pursuit of higher taxes on the wealthy. As the president put it in his second inaugural address in January, he believes "that our country cannot succeed when a shrinking few do very well and a growing many barely make it." The idea that our economy is held back by inequality is echoed in the claims of some of the nation's most prominent economists. Princeton professor (and Nobel laureate) Paul Krugman and David Card of the University of California, Berkeley, contend that inequality hurts economic mobility. Princeton's Alan Krueger (now chairman of the White House Council of Economic Advisers) and Columbia's Joseph Stiglitz (another Nobelist) think it dampens economic growth. Along with Raghuram Rajan, former chief economist of the International Monetary Fund, Stiglitz also argues that inequality was behind the financial crisis. Cornell economist Robert Frank and former labor secretary Robert Reich are convinced that it fuels the indebtedness of the middle class. The Massachusetts Institute of Technology's Daron Acemoglu believes that inequality enables economic elites to capture the machinery of government and thus ultimately produces national decline. But while the credentials of these advocates may be impressive, their arguments are not. Some of these economists seem to think that arguments made for popular audiences do not require the same rigor demanded in academic papers. Others won their well-earned accolades doing groundbreaking research on subjects unrelated to the consequences of inequality and have little expertise in this area. In some cases, these authors examine inequality in America in light of findings from developing countries, failing to acknowledge that the circumstances of those other nations are so different from ours that they render this research inapplicable to the United States. In still other cases, these economists carelessly mistake correlation for causation. Taken together, their errors severely undermine the liberal case about the consequences of inequality. True, a careful examination of the evidence does not establish that inequality is harmless, or that it has nothing to do with our other economic problems. Economic data cannot prove a negative. But they can fail to prove a positive, and they do fail to prove the claims that underlie the left's basic economic narrative. They reveal little basis for thinking that inequality is at the root of our economic challenges, and therefore for believing that reducing inequality would meaningfully address our lagging growth, enable greater mobility, avert future financial crises, or secure America's democratic institutions. Perhaps the most common assertion regarding the ill effects of inequality in our time is that an unequal economy just doesn't work for most people — that inequality impedes growth and harms standards of living. Stiglitz recently declared that, "with inequality at its highest level since before the Depression, a robust recovery will be difficult in the short term, and the American dream — a good life in exchange for hard work — is slowly dying." Less dramatically, Krueger's much-publicized inequality speech at the Center for American Progress in early 2012 included the claim that "the economy would be in better shape and aggregate demand would be stronger if the size of the middle class had not dwindled as a result of rising inequality." There are a number of reasons why, in theory, inequality might reduce growth. It might dampen overall consumption: The rich spend proportionally less of their incomes than the non-rich do, and when a greater portion of the nation's overall wealth flows to those who will not use it for direct consumption, economic activity could decline. Inequality might reduce entrepreneurship by saddling college graduates from lower-income families with crushing student debt. It might stifle growth by reducing workers' motivation, happiness, and social trust, which would tend to reduce their productivity. Or it might cause talent to be allocated less efficiently by closing off paths to success for people who do not start out rich. There is, of course, a rich literature on the relationship between inequality and growth....Although there are many conflicting views, there is ample evidence that inequality can, in fact, hurt growth under many circumstances. But this literature focuses mostly on the experience of developing countries, and its applicability to the challenges currently facing the United States is not entirely clear. Indeed, one of the most widely cited papers in the inequality debates — a 2011 study by IMF economists Andrew Berg and Jonathan Ostry showing that inequality hurts growth — suffers from this very problem of focusing primarily on developing countries. Even putting aside the applicability of these studies, Boushey and Hersh conclude from their review that, "Ultimately, data and methodological issues mean that analyses are too imprecise to deliver definitive answers to this old and central question in economics research." But the problem is not simply that evidence of inequality's alleged harm to growth is inconclusive or imprecise. There is also significant evidence to the contrary, which throws the left's conclusions about inequality into doubt. Recent work by Harvard's Christopher Jencks (with Dan Andrews and Andrew Leigh) shows that, over the course of the 20th century, within the United States and across developed countries, there was no relationship between changes in inequality and economic growth. In fact, between 1960 and 2000, rising inequality coincided with higher growth across these countries. In forthcoming work, University of Arizona sociologist Lane Kenworthy also finds that, since 1979, higher growth in the share of income held by the top 1% of earners has been associated with stronger economic growth across several countries. If there is scant evidence of a link between inequality and poor economic growth, what of the link between growing inequality and stagnating wages? The belief that such a connection exists is, after all, at the core of the left's nostalgia for the golden age that followed World War II, when the economy boomed and distributed its benefits broadly across the American population. New Republic senior editor Timothy Noah spoke for many on the left when he wrote in his recent book The Great Divergence that "there probably was no better time to hold membership in America's middle class" than the 1950s and '60s. This widely held view is a function of muddling the difference between people's well-being and the rate at which that well-being improves. The fact is that the median family today has nearly twice the purchasing power of its counterpart in 1960. The basic well-being of today's family is significantly better than that of a family living in the supposed golden age. The issue is that this modern family's income is growing more slowly than that of its 1960 counterpart, while the incomes of Americans at the top of the income scale are growing far faster. For Noah and others, it could not be more obvious that the latter development accounts for the former — that inequality is holding back middle-class income growth. In this view, even if the middle class is not actually worse off than it used to be, it is being hurt by the growing fortunes of society's richest. But this claim, too, is vastly oversimplified and lacking a solid empirical foundation. The nature of inequality's rise over recent decades has been poorly understood even by many economists. The figure below divides the time between 1948 and 2007 (both business-cycle peaks) into six roughly ten-year periods (each starting and ending with a peak). 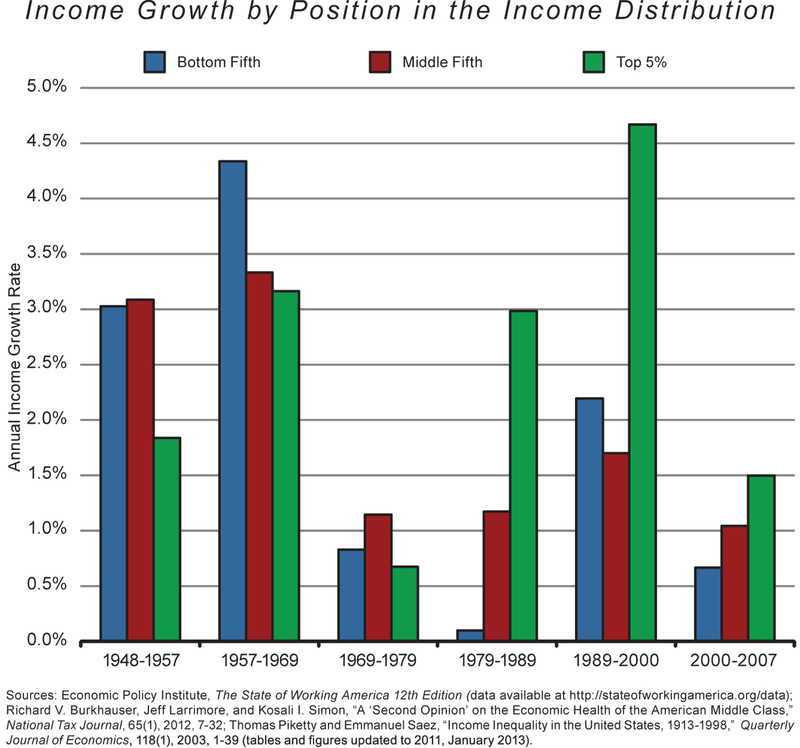 For each period, it shows annual income growth for the bottom fifth, the middle fifth, and the top 5% of earners. It relies on a variety of available tabulations of such data, including family-income figures from the liberal Economic Policy Institute for 1948-79, household-income numbers from Cornell's Richard Burkhauser and his colleagues for 1979-2007, and estimates for the top 5% of "tax units" from Thomas Piketty and Emmanuel Saez. The EPI estimates are based on Census Bureau data, as are the Burkhauser numbers (though he adjusts the figures to account for taxes, household size, and the cost of health-insurance coverage). In making the chart, all of these figures have been adjusted so that they use the same inflation calculation and are thus comparable to one another. Any remaining inconsistencies in the three sources are not significant enough to alter the main conclusions about trends. Consider first the changes in inequality between the poor and the middle class. For all but one of the periods charted above (in the 1980s), inequality between these two groups grew only modestly or declined. Indeed, the decline in inequality between the poor and the middle class during the 1990s was so great that, despite a partial reversal in subsequent years, inequality between these groups in 2007 was no higher than it was in 1989. That year marked a higher level of inequality than in 1969 — when inequality reached one of its lowest levels since World War II — but the increase is not all that consequential. Between 1969 and 2007, incomes for Americans in the bottom fifth of the income distribution rose by 46%, compared with a 63% increase for Americans in the middle fifth. Put another way, if inequality between the poor and middle class is problematic, it has always been problematic — even during the left's supposed golden age — and is not especially so today. The story is quite different when comparing the poor or the middle class to the richest Americans — so-called "high-end inequality." This type of inequality has risen steadily and dramatically since 1979, after declining over the prior 30 years. In the 1950s, '60s, and '70s, the poor and middle class saw bigger gains than the rich. Since 1979, the incomes of the top 5% of earners have risen more than four times as much as the incomes of the bottom fifth and more than three times as much as those of the middle fifth. The increase for the top 1% has been even more dramatic, and the disparities only grow as one moves higher and higher up the income distribution. But is it likely that this dramatically increased prosperity for the wealthiest Americans has suppressed income growth for everyone else? Some of the gains made by those at the top could not have accrued to people lower on the income ladder in any event: For instance, had Chinese investors not enriched bankers in New York, their money would surely have gone to bankers in London or Frankfurt — not to workers in middle America. Moreover, by promoting economic efficiency and broad growth, at least some gains at the top actually make non-rich families better off. And the experience of the recent recession suggests that people lower on the income distribution do not benefit when the wealthiest Americans earn less: Between 2007 and 2009, when the share of total U.S. pre-tax income received by the top 1% of earners fell from 18.7% to 13.4% (erasing the gains of the previous five years), median income fell by 5%. Cato Institute scholar Alan Reynolds notes that the poverty rate tends to fall when the share of income received by the top 1% rises (and vice versa). Looking across several developed nations (including the United States), Lane Kenworthy finds that increases in inequality may lower median incomes somewhat. But when he allows for the possibility that inequality might increase economic growth rates and lead to greater government redistribution, the effect disappears. As to the claim that the incomes of most Americans have stagnated during the period in which those of the wealthiest Americans have soared, Burkhauser's figures suggest otherwise. His research shows that the middle fifth of the income distribution was actually more than one-third richer in 2007 than it was in 1979. The Congressional Budget Office corroborates this estimate, and research by the University of Chicago's Bruce Meyer and Notre Dame's James Sullivan suggests that the increase may have been 50% or more. Such growth could be called "stagnation" only in relation to the golden age of the post-war boom, when the incomes of the middle fifth of Americans doubled over 20 years. Income growth has certainly slowed for poor and middle-class families since then, and not only in the United States: In a range of European and English-speaking countries, demographics and other factors have combined to yield lower rates of economic growth. But there is simply no clear evidence that this slower growth is being caused by rising inequality. It may be true that the government could redistribute at least some income between rich and poor Americans such that the benefits to the poor exceeded the harm done to the rich. But justifying such redistribution requires making a persuasive and empirically grounded case that the status quo is unfair. Analysts such as Jared Bernstein (of the Center on Budget and Policy Priorities) often claim that worker pay has not kept up with productivity, citing this as evidence that gains at the top were effectively stolen from the middle. While it is true that wage increases have lagged behind productivity growth in recent decades, my ongoing research suggests a simple explanation: Compensation outpaced productivity growth during the mid-20th century (in the peak years of unionism), and recent decades have seen a correction in which productivity levels have had to catch up to pay. On balance, the numbers still favor workers: If President William McKinley had been told in 1900 how much higher productivity would be in 2013 and had used that information to guess how much higher hourly compensation would be, his prediction would have been too low. Of course, one can argue that workers' pay increases should outpace growth in the value of what they produce, which is apparently what happened when a greater share of the work force was unionized. But one cannot use productivity trends as evidence that the rich have unfairly siphoned off what rightfully belongs to workers. In other words, when it comes to recent inequality trends, appearances can be deceiving. What has looked like gains for the wealthy coming at the expense of the poor and middle class turns out to be, in historical context, an enduring victory for workers in an 80-year tug of war with capital. The notion that inequality is stifling economic growth or suppressing the wages of the middle class is simply not supported by the available evidence. What, then, of the claim that inequality inhibits mobility? The ways in which inequality is said to restrict opportunity are legion. It purportedly leaves poorer parents with inadequate time and financial resources to invest in their children. It leaves families unable to afford high-quality child care, which also hurts children's development. When combined with economic segregation, income inequality is said to create educational divides by linking school quality to parental income and by exposing poor children to environmental health risks found in congested and polluted neighborhoods abutting industrial sites. Inequality allows richer parents to pay for tutors, test-prep classes, and extracurricular opportunities that boost their own children's chances. In high school and college, it is said, children from richer families are in a better position to take unpaid internships that improve their long-term career prospects. In poorer homes, meanwhile, teens must take jobs to contribute financially to their families, leaving less time for schoolwork and preventing them from getting the grades they need for college admission. Many observers argue that college itself has become less affordable for poorer families because of rising inequality. And richer parents can help their children out financially in young adulthood while poorer parents cannot. In short, inequality reduces economic mobility; in so doing, it diminishes incentives for people to invest in the development of their own human capital, as well as that of their children, thus generating cycles of limited opportunity. These various claims are made by a number of respected academic economists, such as Miles Corak and Timothy Smeeding. As hypotheses, they make intuitive sense. But attempts to rigorously test them have been few and far between. More often than not, analysts fail to make much of a case beyond showing that things have worsened. Since income inequality has risen, they presume it must have caused these other problems. Many observers have used the metaphor of "rungs on a ladder" growing farther apart to convey the idea that, as inequality rises, opportunity must decline. But as noted above, what has happened is that the top rung of the ladder has risen into the clouds, without much change in the distance between rungs on the bottom half of the ladder. If poor children are primarily competing with middle-class children for middle-class opportunities, then the climb up the ladder should not have grown more difficult for them because of inequality. Of what does the empirical case that inequality has hurt opportunity consist, then? Take, as an example, an informative 2011 Russell Sage Foundation volume titled Whither Opportunity?, which presents several studies that point to a number of worrying trends. Among those trends is a widening gap between the test scores of children from low-income families and those of children from high-income families. Similar gaps in college-completion have grown, too. The extent to which kids have higher educational attainment than their parents has declined. Disparities in the amount of money parents with different incomes spend on children's cognitive enrichment have grown. And residential segregation by income has increased, potentially worsening class-based disparities in school quality. But it is far from evident that any of these trends were caused by rising inequality in parental incomes. The test-score gap, for instance, widened as much during decades when inequality was flat as it did during decades when it was rising. Many other factors that contribute to a child's success are associated with parental income, including genes, parenting, family structure, neighborhood and class culture, school quality, and social networks. Any of these factors that became more unequal or more important to success over time could be behind widening disparities among children with different family incomes. The data simply do not support the conclusion to which too many activists and analysts jump: that income inequality is behind the worsening of child outcomes in recent decades. Still other scholars have tried to show that inequality and opportunity are linked using comparisons from other countries. One celebrated example is the "Great Gatsby Curve," named for the rags-to-riches F. Scott Fitzgerald character and popularized by Alan Krueger in his inequality speech early last year. Krueger looked at several developed countries (including the United States), examining both levels of inequality and the relationship between fathers' incomes and those of their sons. He put the two measures on different axes and plotted the countries accordingly, finding that higher levels of inequality corresponded with lower levels of intergenerational mobility. The line drawn through the plots, quantifying the relationship between inequality and mobility, was the Great Gatsby Curve. Krueger is not alone in using data from other countries to try to draw broad conclusions about inequality that may be applied to the United States. Epidemiologists Richard Wilkinson and Kate Pickett wrote an entire book, The Spirit Level, comprised of cross-national scatter plots claiming to show inequality's central role in a plethora of social ills. Inequality, they argued, affects not just mobility but societal trust, mental illness, rates of imprisonment, life expectancy, infant mortality, obesity, homicide, and even public spending on foreign aid. But the arguments in both The Spirit Level and Krueger's analysis are deeply flawed. The basic issue in both cases is the same problem that has bedeviled other arguments about inequality: Correlation does not always indicate causation. High-inequality countries and low-inequality countries differ in many ways. Kenworthy, for instance, has noted that Nordic education policies could be behind the Great Gatsby Curve. More devastatingly, Manhattan Institute scholar Jim Manzi found that the Great Gatsby Curve was just as evident when countries' inequality levels were replaced with the sizes of their populations. Furthermore, the available data show no cross-national association between wealth inequality (as opposed to just income inequality) and earnings mobility. Nor do they show any relationship between income inequality and educational mobility. And the strength of the cross-national correlations between income inequality and mobility varies widely depending on which data sources are used to assess inequality and mobility in each country. In some versions of the scatter plot, the correlation is driven by just a few countries. In another example of widely cited research using geographical comparisons, economists Melissa Kearney and Phillip Levine found a relationship between teen pregnancy among disadvantaged youth and income inequality across different U.S. states (as well as a handful of developed countries). Their work is more rigorous and suggestive than Wilkinson and Pickett's scatter plots are, but it is far from conclusive. In particular, their analyses do not consider the rather obvious possibility that levels of teen pregnancy in earlier periods may have affected inequality, which remains correlated with recent teen pregnancy levels. That is, rather than inequality causing teen pregnancy among the disadvantaged, teen pregnancy among the disadvantaged may lead to greater inequality. It also seems likely that there may be cultural or historical roots to the patterns Kearney and Levine uncover: Their conclusions might be more relevant, for instance, if the states with both high inequality levels and high teen birth rates had been distributed randomly around the country, rather than concentrated in the Deep South. A better approach to testing hypotheses about inequality and opportunity is to look not at snapshots of both in a few countries, or at how both evolved in a single country, but rather to test whether any relationships between inequality and opportunity hold as both indicators change across geographies. This strategy has been pursued in ongoing research by Kenworthy, who concludes that rising inequality probably has not lowered college-graduation rates, increased single parenthood, or pushed up murder rates (though it may have had small effects on life expectancy and infant mortality). The direct evidence on trends in economic, educational, and occupational mobility is very complicated. Few studies of intergenerational mobility consider children who were exposed to rising or high inequality. Most of the evidence on earnings and income mobility suggests only small changes over recent decades. I recently finished new research on this subject that included men born in the early 1980s (who thus experienced rising inequality within "the 99%," to borrow the term of the Occupy Movement, as well as between the 99% and the top 1% of earners). I found that, compared with men born around 1950, these young men have experienced, at most, only a bit less mobility. Among those raised in the bottom quarter of the family-income distribution, the fraction escaping the bottom fourth of earnings as adults fell from 63% to 60%, a decline too small to be reliably different from zero. In fact, they may have experienced greater mobility than men born in the early 1960s, when only 54% escaped the bottom fourth. In other words, when it comes to the purported relationship between inequality and "declining opportunity," the problem may not be insufficiently rigorous explanation. Rather, it could be that there is no decline that needs explaining in the first place. Perhaps this is why leading mobility researcher Michael Hout, a Berkeley sociologist, concluded in 2004, "[The] literature to date has offered surprisingly little evidence that links intergenerational difference and persistence (mobility and immobility) to economic or other inequality." The common notion that economic inequality contributes to financial crises — advanced in recent years by Raghuram Rajan, Joseph Stiglitz, and others — is particularly under-examined. The argument is that inequality leads to political pressure to ease credit so that the poor and middle class can sustain their consumption. The over-leveraging that results leads to defaults that ripple through the financial system. There has been very little empirical work to assess this widespread claim, and what little evidence there is raises serious questions about these conclusions. A recent paper by economists Michael Bordo and Christopher Meissner summarizes the existing evidence and shows that, across countries, rising inequality does not consistently predict financial crises. Credit booms tend to precede crises, but credit booms do not appear to be caused by rising inequality. Another group of researchers has focused not on credit booms and financial crises but on the more basic argument that inequality has caused increasing numbers of Americans to spend more and save less, putting them ever deeper into debt. According to Cornell economist Robert Frank, as the rich have pulled away from the rest of society, their consumption patterns have grown ever more conspicuous. Their houses have grown in size and number; their cars have become more luxurious; their parties and celebrations have grown more lavish. These spending patterns — for reasons both practical and psychological — have led those just below the richest of the rich to stretch their own budgets in order to keep up. This, in turn, has prompted a similar reaction among the Americans one rung below them on the income ladder, triggering an "expenditure cascade" that continues throughout the income distribution. The result is that everyone is more financially pinched and no one is better off (because, Frank argues, all this spending simply maintains the existing ordering of social status and wealth). Frank's hypothesis is a textbook example of using inequality to explain an overstated problem. In a paper with Adam Levine and Oege Dijk, for example, Frank cites with alarm the fact that the square footage of new homes rose by one-third from 1980 to 2001 — "more than twice the corresponding growth in median family earnings." But Congressional Budget Office data that improve on the conventional Census Bureau estimates on which Frank relies actually show an increase in median after-tax household income of between 30% and 37% over this period — roughly on par with the growth in home sizes. Similarly, as Boston College's Center for Retirement Research has shown, savings rates among the working-age population have declined less than the personal savings rate estimated for national accounting purposes that Frank cites. And while Frank is right that consumer debt has risen considerably since the 1980s — with the median level nearly tripling among debtor households in the middle fifth of the income distribution between 1989 and 2007 — that increase was, to a large extent, balanced by the rising value of assets. Among those same households, debt as a portion of assets rose only from 15% to 23% between 1989 and 2007 — not all that worrying an increase. The share of households with debt payments equaling more than 40% of their incomes rose from 9% to just 12% over that time. The financial crisis exacerbated this trend only minimally: Among middle-income households, debt was 25% of assets in 2010, and 12.5% of households had debt payments that amounted to more than 40% of their incomes. A second problem with Frank's analysis is that he has mostly failed to test the key elements of his story. He does not attempt to quantify how much value people really place on keeping up with the Joneses as opposed to their own absolute standards of living. For instance, he notes that, because job applicants must look good during interviews, when wealthier people buy nicer suits, so too must beleaguered middle-class interviewees. When richer parents segregate themselves into expensive school districts to ensure that their kids get the best educations, others lower down the economic ladder are also compelled to seek out pricier neighborhoods with better schools. Yet much of this is simply assumed; Frank never provides any evidence that the importance of the interview suit, or of enrolling children in the best possible school, looms large in people's minds and influences their financial decisions. Just as important, Frank does not demonstrate to what extent, if any, benefits from additional consumption are negated when others increase their consumption; he just assumes that when everyone consumes more, the gains are significantly eroded by the maintenance of everyone's place on the ladder. In fact, Frank has attempted only recently to substantiate the existence of links between inequality, overconsumption, and signs of financial distress. In his paper with Levine and Dijk, he finds that the change in income inequality over the 1990s was correlated across states and counties with the change in bankruptcy filings, the change in divorce rates, and the change in average commute times. But the theoretical link between inequality, overconsumption, and either divorce or commute times is awfully weak. Rising inequality is hypothesized to lead to more financial stress, which leads to more divorce and longer distances between work and affordable neighborhoods. But even if rising inequality did increase divorce rates or commute times, it is hardly clear that it did so by putting financial pressures on the poor and middle class: As the earlier chart shows, the 1990s saw robust increases in income even for the non-rich. Nor does the study tell us whether the negative trends associated with rising inequality across counties are concentrated among the poor and middle class. Frank's hypothesis is, however, supported by one additional study, conducted by economists Marianne Bertrand and Adair Morse. Bertrand and Morse find that, within states and over time, higher incomes at the top of the distribution are associated with more bankruptcies and more people saying their financial situation has worsened over the past year throughout the income distribution. Bertrand and Morse also find that, within states, a 10% rise in expenditures by households in the top fifth of the income distribution is associated with increases of 1.3% to 3.6% in expenditures by everyone else, even after accounting for increases in income below the top fifth. (The effect is smaller and not statistically meaningful for poor households.) There is some evidence, however, that part of this phenomenon is caused not by increased financial pressure on the non-rich to "keep up" with the rich, but rather by greater housing wealth and the borrowing against home equity that that increased housing wealth induces. In other words, rising inequality may increase the demand for housing among those at the top of the income scale, in turn boosting the home values of the non-rich, and then leading those newly wealthy home owners to tap into their increased home equity. It is also worth noting the evidence in the paper by Bertrand and Morse indicating that any effect of inequality on overconsumption is primarily about status maintenance. Among the non-rich, spending on housing and home maintenance (including on domestic services) was particularly sensitive to the spending levels of the rich, as was spending on recreation and appearance-focused categories of consumption — including clothing, jewelry, beauty services, and health clubs. Spending on education, on the other hand, was among the least responsive to expenditures at the top, as was spending on transportation. Neither Frank's paper nor Bertrand and Morse's has been peer reviewed and published. Their preliminary findings, however, do suggest one way in which inequality really may affect the poor and middle class: When the rich spend more, spending apparently increases among the non-rich over and above what their income gains would dictate. Kenworthy, too, reports that, across countries, rising inequality is associated with declines in savings. But since the incomes of the bottom and middle have increased significantly over time even after adjusting for changes in the cost of living, it is difficult to imagine that this is a story about rising hardship. Moreover, if the story Frank tells about spending is really a tale of status maintenance — as the findings by Bertrand and Morse suggest — it is hard to see how it calls out for an urgent public-policy solution. Even people sympathetic to the idea of a safety net for the poor and a role for the government in promoting mobility are unlikely to see it as the state's responsibility to save consumers from themselves, discourage thrift, or subsidize people who live beyond their means. The liberal tale of inequality's consequences extends beyond economics into politics. A number of prominent economists — along with a few highly visible political scientists — have worried in recent years that rising inequality might pose some threat to democracy. They have suggested that growing income divides may reduce voting or other forms of participation that require time and money, and have expressed fear that these disparities will allow the rich to buy elections or make elected officials unduly responsive to those with deep pockets. Economists Daron Acemoglu of MIT and James Robinson of Harvard take this line of reasoning to its logical conclusion: On the basis of evidence from developing countries, they argue that inequality leads the rich and the representatives they buy to establish extractive political institutions that direct redistribution upward. And Acemoglu and Robinson believe — but make little effort to show — that this evidence has direct implications for American inequality. Political scientists Nolan McCarty, Keith Poole, and Howard Rosenthal have even argued that rising inequality has caused the political polarization now seen in our national politics. Their evidence basically amounts to the same "things got worse over the same period in which inequality rose" case used to argue that economic inequality has diminished opportunity. Again, correlation and causation are harmfully confounded. The truth is that political science has only begun to consider these questions and has yet to reach any consensus. Many in the field are well aware of this inconclusiveness. In 2004, the American Political Science Association Task Force on Inequality and American Democracy concluded, "We know little about the connections between changing economic inequality and changes in political behavior, governing institutions, and public policy." The past eight years have not seen new research that ought to alter that conclusion. We discovered that no real consensus exists on how different groups [including those defined by income] influence policy. Not only were there debates about differences between groups, there were also serious disagreements about whether these differences matter....[T]he conference made clear that we do not yet have a good answer to the question of who gets represented. Enns and Wlezien examined how policy preferences differ between rich, middle-class, and poor Americans. They found that the three groups have very similar preferences for increasing public spending on crime, education, health, and the environment, and common preferences for spending less on defense. The poor are less supportive of reducing spending on welfare than are the middle class and rich, and they are less likely to believe their taxes are too high. But these gaps have not changed much over time and show no relationship to changes in inequality. Regarding the possibility that the preferences of the rich, middle class, and poor are unequally attended to, Enns and Wlezien conclude that "there is little difference for policymakers to represent." Other work, reported in the 2004 Russell Sage Foundation volume Social Inequality, finds little or no relationship across countries or in the United States over time between income inequality and government generosity to the poor. Kenworthy, too, concludes that rising inequality probably has not lowered expenditures in support of safety nets. Recent books by political scientists Larry Bartels and Martin Gilens have received significant attention for finding that the votes of members of Congress and federal policy outcomes are more aligned with the ideological identifications and policy preferences of the rich than of the middle class or poor. In contrast, Robert Erikson and Yosef Bhatti, in a chapter in the Enns and Wlezien volume that directly addresses the Bartels research, fail to find any evidence of unequal representation. In part, they report, this is because "ideological preferences among different income strata of state electorates are almost impossible to separate statistically." In other words, the claims of inequality's political effects are even more difficult to demonstrate, and even more poorly established empirically, than are the claims of its economic effects. It is, of course, possible that future research will more rigorously and consistently identify negative effects of income inequality on economic, social, and political outcomes. The point of reviewing the existing evidence is not to argue that such effects do not exist; nor is it to argue that the things inequality is said to affect are unimportant. It is, rather, to argue that the evidence behind the liberal narrative of inequality as a driver of our social and economic woes is not nearly firm enough to support the political and policy arguments now often built upon it. One can be concerned about economic growth, financial stability, and economic mobility regardless of whether income inequality harms any of them. Those who are convinced that inequality must have harmful consequences might interpret the case made here as simply an attempt to "muddy the waters" by raising doubt about necessarily imperfect, but nevertheless serious, research. But the motive here is quite the opposite. After all, finding statistical relationships between economic and social problems is easy; it is the failure to rigorously test hypotheses about the meaning of these relationships, as well as the inclination to selectively cite research friendly to one's position, that muddies the waters. Pointing out the limits of our knowledge is a way to clear things up. The greater clarity made possible by such an effort should help many liberals see the need to rethink their rhetoric, if not their economic priorities. There is simply very little evidence to suggest that, within the range of inequality that modern countries have experienced and the range seen in our country over the past century, income disparities between the rich, middle class, and poor merit the intense attention lavished on them by the left.